Like German culture? Love dressing up? Why not treat yourself to a fun, authentic and traditional dirndl for your next party or get-together? With an Oktoberfest-dirndl.co.uk voucher you can enjoy great savings on a wide range of dirndls and accessories for both men and women. So whether you want to recreate the classic look or go for something a little more modern and edgy, Oktoberfest-dirndl.co.uk voucher codes will save you money while you shop. Oktoberfest-dirndl.co.uk was established to provide a reliable, accessible online store selling dirndls and related products to fans of German culture all around the world for Oktoberfest, fancy dress parties and just general fun. Dirndls, the traditional dress of Germany – in particular the region of Bavaria – have come to become an integral part of Oktoberfest. When beer fans from around the world gather to celebrate this annual occasion, a key part of the celebration is the serving of delicious beverages by comely waitresses – and waiters too – decked out in traditional garb. The outfits are fun, eye-catching and surprisingly flattering – so it's no wonder that many visitors return home wondering where they can get a similar look for themselves. At Oktoberfest-dirndl.co.uk, customers from around the world can recreate that genuine Oktoberfest look. They stock a wide range of traditionally-inspired clothing for both men and women – all for a fantastic price. Want a traditional dirndl for your own trip to Oktoberfest or perhaps a fancy dress party or special occasion? Oktoberfest-dirndl.co.uk has a wide range to choose from including short dirndls and dresses, mid length dirndls and dresses, long dirndls and dresses and more. Or perhaps you're looking for some more modern clothing with a traditional twist? You'll find shirts, t-shirts, jeans, sweaters and more – all inspired by the classic Bavarian look. Oktoberfest-dirndl.co.uk also stocks a selection of clothing for men so that they can join in the fun too. From traditional lederhosen and waistcoats to vests, jackets and even shoes and socks, there's something to suit every budget and taste. There's even an extensive Oktoberfest section packed full of information on the various popular Oktoberfest events around the world from the German celebration to international versions as far afield as China, Brazil, Russia and the USA. And once you've chosen the products that are right for you, Oktoberfest-dirndl.co.uk's swift and reliable delivery service will ensure your orders arrives in record time. 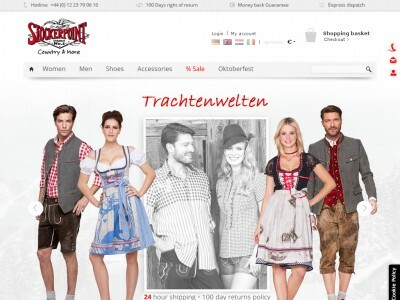 Want to get shopping with Oktoberfest-dirndl.co.uk? With an Oktoberfest-dirndl.co.uk voucher you can enjoy great savings on their wide range of products. So whether you're shopping for yourself or as a unique gift, Oktoberfest-dirndl.co.uk vouchers will help you save the pennies. Browse our website until you find an Oktoberfest-dirndl.co.uk voucher that suits you, then navigate to their website to begin shopping. When you're finished shopping, click 'Show shopping basket'. Enter your Oktoberfest-dirndl.co.uk discount codes in the box provided and click 'Add'. If you've enjoyed shopping at Oktoberfest-dirndl.co.uk, you might also like to check out more great deals on clothing at stores like Debenhams or TK Maxx. Or, if those aren't right for you, you'll find plenty more deals to browse in our Fashion, Accessories and Jewellery section. Enter your details and click 'Complete registration'. Choose your payment method and click 'Execute payment'. Enter your payment details and click 'Pay now' to complete your order. Shipping costs vary dependent on the package weight. A choice of delivery options to the UK are available. If you need to return a product for any reason to Oktoberfest-dirndl.co.uk, you can do so by simply returning your items in their original condition within 100 days of receipt. Need to contact the team at Oktoberfest-dirndl.co.uk? Whether you have a question about your order, want some expert advice on planning your Oktoberfest outfit or simply want to find out how you could make big savings with Oktoberfest-dirndl.co.uk voucher codes, you can contact the Customer Services department in the UK by telephoning 01223 790 610. Want to find out more about dressing to impress this Oktoberfest with Oktoberfest-dirndl.co.uk? The company maintains a profile across all your favourite social media platforms? Follow them for lots of exclusive content including promotions, Oktoberfest articles, competitions and much more. You can also use these pages to find out more about savings money with Oktoberfest-dirndl.co.uk vouchers. Don’t forget to check them often, as you can never be sure when a free Oktoberfest-dirndl.co.uk voucher might be waiting for you! Buy now online at www.oktoberfest-dirndl-shop.co.uk. When me and my best friend went to Germany for Oktoberfest we wanted traditional costumes – but everything we found online was so expensive. Luckily I discovered an Oktoberfest-dirndl.co.uk voucher online. At oktoberfest-dirndl.co.uk they stock a wide range of traditional dirndls, dresses and more – all available at a discount with Oktoberfest-dirndl.co.uk voucher codes. I used my Oktoberfest-dirndl.co.uk vouchers to get a great deal on two matching short dirndl dresses, and me and my friend had a great time wearing them over the weekend. See what you could save with an Oktoberfest-dirndl.co.uk discount code!